Ngong Road Children Association (NRCA) contracted with Success Signature to facilitate the Life Skills Training Program (LSTP) made possible by a Rotary Global Grant led by the South Metro Minneapolis Evenings (SMME) Rotary Club and the Kikuyu Rotary Club of Kenya. The aim of LSTP is to develop self-awareness in both secondary and post-secondary students by training them on carefully selected and essential skills that will aid in their life success. The training curriculum was developed by US volunteers Meghan and Evan Feige and tested in Kenya in early 2017 with December 2016 Form 4 finishers (high school graduates). The first phase of training was officially launched on November 8th, 2018 at the Lutheran Church, Ngong Road and lasted three weeks. In attendance were 94 students from Form 2 through Form 4, 2017 (grades 10 through 12), NRCA staff, parents/guardians representatives, Rotary Club of Kikuyu representatives and Success Signature (SS) staff. Bus fare and meals were provided to all students to ensure they could attend. The launch brought all the stakeholders together for the introduction to the program. NRCA staff provided the background of the LSTP and the intended benefits to the students. Students got a chance to meet the facilitators, while Success Signature staff provided an overview of the program including the topics, timetable, expectations, rules, and regulations governing the program, and completion of pre-training evaluation of each student. The Lutheran Church, Ngong Road is located next to the NRCA offices and was both convenient and adequate in terms of space and facilities. The training program ran daily from 9:00 am to 3:00 pm. The following topics were covered with all three Forms: communication, conflict management, critical thinking, stress management, leadership, emotional intelligence, personality type, Who Am I? (personal branding), essential skills- time management, money management, study skills, and technology. Both NRCA and SS staff were clear about the level of discipline needed from all the students and this yielded great results. Students were encouraged to participate by awarding the three most valuable, active students each day. Each student was given a token of Kes. 200 (USD $2) by the facilitator. This worked miraculously well and created very healthy competition and a lot of fun. Students were also always reminded to respect everybody’s contribution while learning. Learning was fun for all. How will you apply them in your life beginning today? “This program has really benefited me as I have a better understanding of WHO I AM and hope it will continue to benefit more students. “I have been in conflict with my father since I did not like to be directed, after the conflict management training, I was able to approach my father and it is after a long time that we sat as a family and laughed together. I am very happy to be in a good relationship with my father”. “I spent a lot of time on social media and I will now use my time well and research constructive things”. The success of the LSTP can be attributed to the development of the curriculum by Meghan and Evan, NRCA provision of bus fare and meals, adequate preparation by all the parties involved, effective teamwork, constant communication to review and ensure on track status and passion and commitment from all the parties. We hope that our students are going to take full advantage of this opportunity. A big thank you to Megan and Evan, Rotary International, FoNR and Success Signature for making the program possible. Camp 2018 was a success! Over 90% of the NRCA students attended grammar and senior camp. Together with the students, volunteers, and NRCA staff, everyday was a fun, new adventure. Children were able to mingle with old friends and make new friends. They enjoyed nutritional meals and new experiences during field trips. The field trips to William Holden Animal Foundation and Ngare Ndare Forest Trust offered students great exposure to natural resources and the opportunity to learn about conservation. Students were also able to engage in fun sports activities, problem solving games, crazy games and Olympics. There was a great show of team spirit and collaboration during camp! Because of you, NRCA students know that they are in charge of their future and their dreams. Thank you for taking charge to make a positive change in the lives of our students. 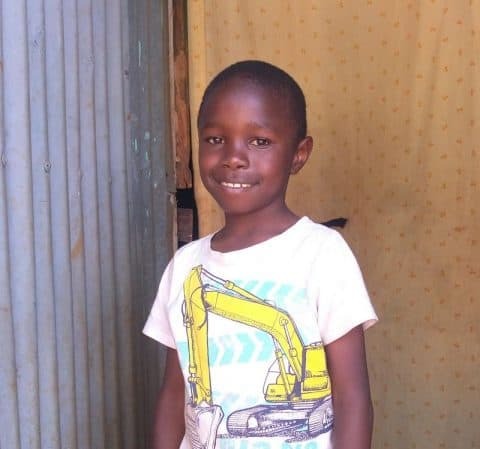 In Gavin’s essay titled “I Believe I Can,” Gavin describes going to a secondary boarding school and being judged by his peers for coming from the slums. With self awareness and courage, he reached out to his school counselor for help. He writes, “I now view myself as someone born to succeed from a gloomy past…I can be anyone in the society I believe I can.” At camp each year, students write essays about their lives connected to the camp theme. Students often share intimate, powerful parts of their lives. Gavin, John, Edmond, Tina, Tito, and Joyce invite you to read their full essays. As you are probably aware, the students of the Ngong Road Children Association (NRCA) live mainly in the slums, where they live difficult lives and have limited exposure to good physical and social amenities. Because of this, the annual August Camp is truly the highlight of the year for our students. Thanks to generous sponsors, donations and volunteers that come every year, we have run very successful camps for the last ten years, and each year it gets better and better! Provide unique, fun educational experiences. Create a close-knit, supportive community, where students develop a strong sense of belonging and where they are exposed to and taught about good personal values. Develop leaders and teach leadership skills. Provide a new view of the world to all who attend camp, both students and international volunteers alike. Give students who live day to day lives in poverty and in difficult circumstances, the opportunity to just have fun and be kids in a safe environment. The net result is an experience that changes lives – those of the students, and those of the volunteers both from Kenya and other countries. Our NRCA students are anxiously waiting for this year’s August Camp, which is scheduled for August 6th to 22nd. We are currently working on creating an exciting program of indoor and outdoor activities designed to challenge the students physically and mentally. Run in an environment that encourages openness, camp will include guest speakers who put emphasis on discipline and hard work as cornerstones for success, as well classes to help students develop key personal and life skills to prepare them for their future careers and help them grow up as responsible citizens. I know our students are lucky to have both local and international sponsors and supporters who are touched by their plight and who generously sponsor their formal education. Camp goes beyond this and provides a means to develop the all-round person. As you can imagine, holding an off-site 17-day camp for our 377 students is costly. Against this background, in June we will be kindly inviting our enthusiastic supporters to make donations to ensure that every student gets the opportunity to attend this year’s camp. I would like to take this opportunity to wholeheartedly thank all stakeholders who have sacrificed their time and funds to ensure that previous camps have been successful. Be on the lookout to “Send a Kid to Camp” this June! Tabitha Ongachi told Friends of Ngong Road President and Founder, Paula Meyer, that she “never thought she would graduate from Form 4.” She knew it was not affordable on her family’s little income. In December 2017, she did just that! Tabitha has been sponsored by Jamie and Nancy Letcher since she joined the program in 2008 after her father died from AIDS. 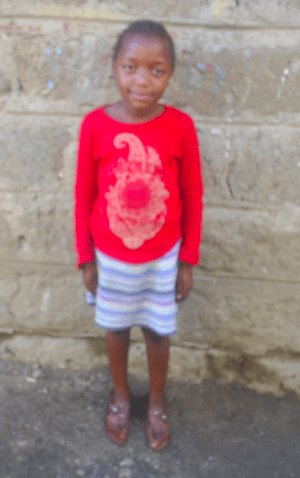 She and her mother were living with two of her aunts while struggling to make it in the slums of Nairobi. Her mother occasionally washed clothes for other families and sold odds and ends to get enough income for one meal a day. Tabitha excelled in her primary school environment often performing at the top of her class. 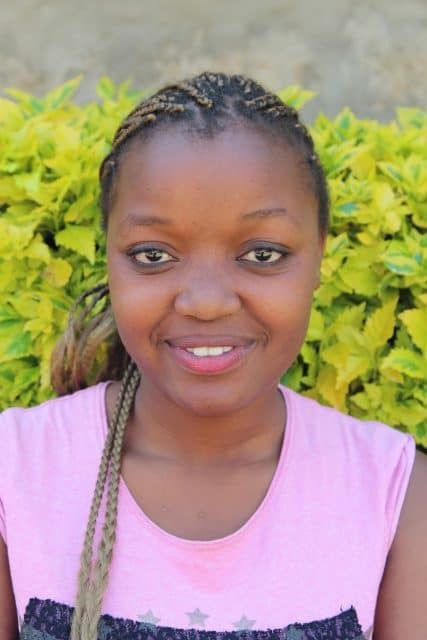 She was determined to do well and with a high score on her eighth-grade exam, she was accepted into one of the most prestigious secondary schools in Nairobi, Ngara Girls Secondary School. Although she was one of the few students coming from a background of extreme poverty at the school, she continued to perform well and made friends with students from all different backgrounds. In December 2017, Tabitha scored a B- on her Kenya Certificate of Secondary Education exam. 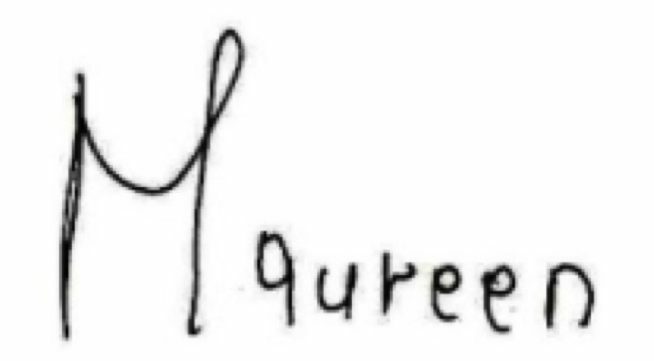 She dreams of becoming a forensic scientist and will be applying to university in the fall. In December 2017, Tabitha was chosen to be a “Youth Peer Provider” for the new sexual and reproductive health program. Fourteen students were trained through Planned Parenthood Global and eight selected to lead the training for their peers. While applying to post-secondary schools, she has attended our computer training course and Life Skills program led by Megan and Evan Feige of Minneapolis, MN. The program will be expanded later this year thanks to a Rotary Global Grant with the South Metro Minneapolis Evenings Rotary Club and the Kikuyu Rotary Club of Nairobi. She is a respected leader among her peers and an inspiration to her two younger brothers.